The control room at Raleigh, North Carolina-based facility Post Pro, featuring a Neve Genesys console sourced through GC Pro. 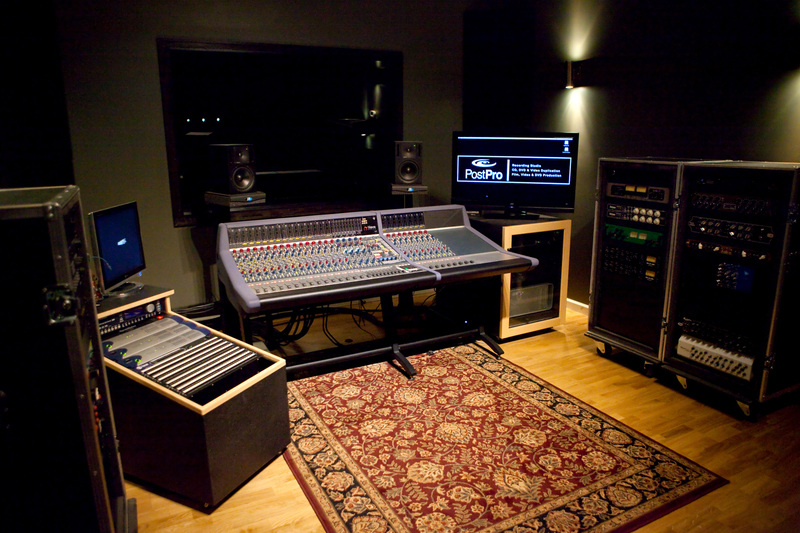 The tracking room at Raleigh, North Carolina-based facility Post Pro. The facility features various gear, including a Neve Genesys console, sourced through GC Pro. WESTLAKE VILLAGE, CA, August 5, 2013 — Matt Horton’s Raleigh, North Carolina-based facility Post Pro is a primer on what it takes to keep a commercial studio facility afloat and successful in an uncertain economy and in a secondary market. The most recent location opened last December, but Horton has done business in two other locations over the last two decades. Horton chose early on to diversify his services; he’s hosted recording, mixing and mastering sessions for a range of well-known artists including Matchbox Twenty, Big Daddy Kane, Evanescence, Swizz Beatz and Julio Iglesias, as well as audio post work for corporate clients like Winnow Creative and Brazilian filmmakers. Horton has also been overseeing a transfer of original two-track masters from legendary art rockers Devo. Horton notes, “The way we’ve made it work is to be able to do it all, a bit of everything that the client could need,” from basic tracks to mixing, mastering and video post, to CD and DVD duplication and even audio restoration and forensics services. With the opening of the new complex, Horton sourced a Neve Genesys console through Guitar Center Professional (GC Pro), the outside sales division of Guitar Center that focuses on the needs of professional users. The new studio facility consisting of the following spaces: Studio A’s large tracking room and spacious control room, the latter centered around a 24-channel Genesys console with Neve 1073 microphone preamps and Neve 1084 equalizers on each channel and Avid Pro Tools HD and Studer and Tascam analog multitrack recorders; a smaller preproduction studio loaded with over 30 vintage and new hardware synths and drum machines; and the Video Post Suite featuring a Euphonix MC Pro control surface and Blackmagic Design hardware. There’s lots of other gear, esoteric and otherwise, much of it sourced through GC Pro. Horton says they were the only place in the country that could get him the Neve Genesys, which he says he bought before he ever actually heard it. “I’ve worked on a Neve many times and I know what a 1073 sounds like, and it just makes me gush inside,” he notes. “Getting that Neve console was a very happy moment – I was blown away by it. It just sounded like heaven.” Horton says that GC Pro has been a resource for him for most of the years he’s owned Post Pro, and he’ll be back there in the near future to add more Neve 1084 preamp/EQ modules for channels 17-24 on the Genesys. Photo Caption 1: The control room at Raleigh, North Carolina-based facility Post Pro, featuring a Neve Genesys console sourced through GC Pro. Photo Caption 2: The tracking room at Raleigh, North Carolina-based facility Post Pro. The facility features various gear, including a Neve Genesys console, sourced through GC Pro. Guitar Center is the leading United States retailer of guitars, amplifiers, percussion, keyboards and pro-audio and recording equipment. Our retail store subsidiary operates 251 Guitar Center stores across the United States. In addition, our Music & Arts division operates 101 retail stores specializing in band and orchestra instruments for sale and rental, serving teachers, band directors, college professors and students. We also are the largest direct response retailer of musical instruments and related products in the United States through our wholly owned subsidiary; Musician’s Friend, Inc., and its catalogs and owned or operated websites. More information on Guitar Center can be found by visiting the Company’s website at www.guitarcenter.com.